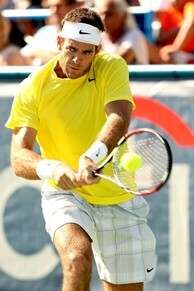 Juan Martin del Potro returns a shot to John Isner during his third title win in Washington, D.C., in 2013. History: The tournament was started in 1969 by Washington native and former touring pro, Davis Cup captain and agent Donald Dell. Arthur Ashe and Stan Smith both played in the inaugural event. Past champions in Washington include Ashe, Andre Agassi, James Blake, Michael Chang, Jimmy Connors, Stefan Edberg, Ivan Lendl, Yannick Noah and Andy Roddick. A portion of the proceeds from the Citi Open benefits the Washington Tennis & Education Foundation, which is dedicated to improving the life prospects of low-income, underserved kids in the D.C. area through athletic and academic enrichment. 2013 Recap: Top seed Juan Martin del Potro won the Citi Open for the third time, cruising to the final without dropping a set before defeating John Isner, 3-6, 6-1, 6-2, for the championship. The victory extended the Argentine's winning streak in Washington to 14 matches. In doubles, third seeds Julien Benneteau of France and Nenad Zimonjic of Serbia captured the title with a 7-6, 7-5 victory over the unseeded team of American Mardy Fish and Radek Stepanek of the Czech Republic. 2014 Preview: Held at the William H.G. FitzGerald Tennis Center in Rock Creek Park at 16th & Kennedy Streets, NW, in Washington, D.C., the Citi Open is scheduled to take place during Week 2 of the 2014 Emirates Airline US Open Series. As one of only 11 prestigious ATP World Tour 500 tournaments worldwide, the event routinely boasts a strong player field, which in recent years has included del Potro, Isner, Grigor Dimitrov, Tommy Haas, Kei Nishikori, Sam Querrey and Milos Raonic. Fun Fact: The Citi Open's tournament mascots are Bam and Boo, two fictional tennis-playing pandas, who met as babies at the National Zoo and are considered a dynamic doubles pair.